As craft beer becomes both more commonplace and more adventurous, it’s interesting seeing the breweries that seek commodity and those who release experiments. Avery is definitely in the latter category, particularly with their sour and barrel series, which includes the Botanicals & Barrels program of wild ales that let time play its natural course on the beer. 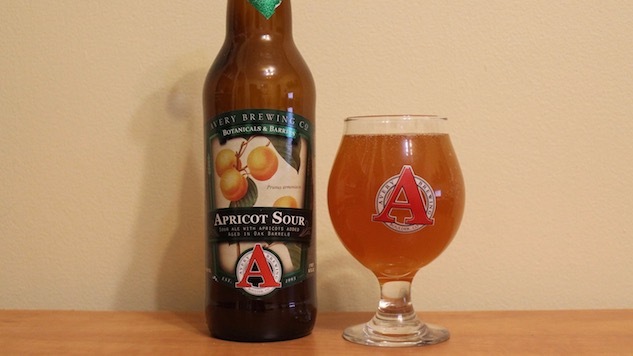 Apricot Sour is the latest Botanicals & Barrels release and it’s heavy on the sharp tart first impression that has created a love-hate relationship with sour beers for many. While visions of apricot give the idea this beer may be sweet and light, it’s instead puckering and complex, yet subtly balanced between strongly acidic lacto flavor and a calm and soothing apricot that pulls it away from that eye-opening first sip. Pouring an opaque apricot hue, the beer is notably carbonated and fizzy. From there, the nose gives an accurate depiction of its dominant acidity with some fruity esters that cut through the tart first sniff and ultimately extend a flavor profile that ends in a delicate balance of sugary apricot and tempered malt sweetness that bites off with a surprisingly clean finish for such a potent beer. Though aged in oak barrels, the wood doesn’t really come through in the flavor, and the apricot continues to become more potent as the beer warms. This is a big lacto beer and the tart is definitely flavor number one while the additional ingredients provide a well-balanced supporting role to flesh it out and make it stand out beyond the big first impression. Instead of letting apricot take the beer into an overly sweet dessert realm, the fruit addition smoothly counters the bold tart punch and then drifts away. It’s a big and bold beer, but one where the fruit gives some delicacy.